Ken Yuszkus/Staff photo. 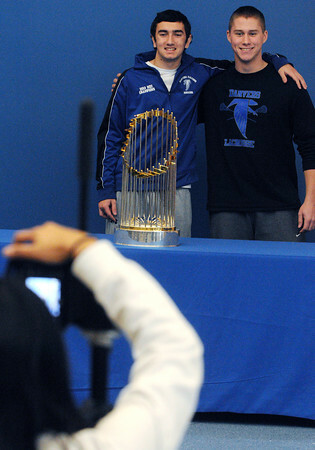 Danvers: Danvers High School juniors Kyle Cahill, left, and Stephen Ganley pose for a photograph with the Red Sox World Series trophy at the school. Photos were taken of all the students and faculty at the school with the trophy that wanted a photo.